The Trump administration says it’s working to ensure Russia does not meddle in American elections as it did in the past. The White House said on Wednesday that there was “still” a threat of Russian meddling in the US elections, claiming that President Donald Trump was not referring to that issue when he responded to journalists hours earlier. The Trump administration said it was working to ensure Russia did not meddle in American elections as it did in the past. The US intelligence agencies believe that Russia interfered in the 2016 presidential elections won by President Donald Trump. However, Russia has denied the allegations. “We believe that the threat still exists, which is why we are taking steps to prevent it,” Press Secretary Sarah Sanders told reporters at the White House daily briefing on 18 July. During a cabinet meeting in the White House earlier, reporters had asked Trump if he believed Russia was still trying to interfere in US elections, towhich which the President had said “no”. Sanders, however, said the President’s “no” was in response to another question. “The president said, ‘Thank you very much,’ and was saying ‘no’ to answering further questions,” Sanders said. In the exchange with the press in the Cabinet room, Trump said there had “never been a president as tough on Russia” as himself, adding that Russian President Vladimir Putin “knows that better than anybody”. From the beginning of his administration, Sanders said, Trump had actually taken action to defend US election system from meddling and interference. In May 2017, she said, Trump signed an executive order to strengthen and review the cybersecurity of the US and its critical infrastructure, adding that the Department of Homeland Security (DHS) had taken the lead in working with all the 50 states, local governments and private companies to improve election security. “The DHS has increased coordination among all election partners, 34 states, 52 counties and local governments and five election companies receive cybersecurity scans regularly from the DHS,” she said. The DHS is said to be planning to provide on-site risk and vulnerability assessments to all states that request it, and accord to Sanders, 18 states have so far requested this assessment. She added that a new pilot programme was launched to increase rapid response capabilities on the Election Day, and in 2017, on-site cybersecurity support was provided. In March, Sanders said, Congress provided the Election Assistance Commission with USD 380 million in funding for election assistance grants to states. “These are steps that we’ve taken to prevent it from happening. These are steps that we’ve taken because we see that there’s a threat there,” Sanders said. 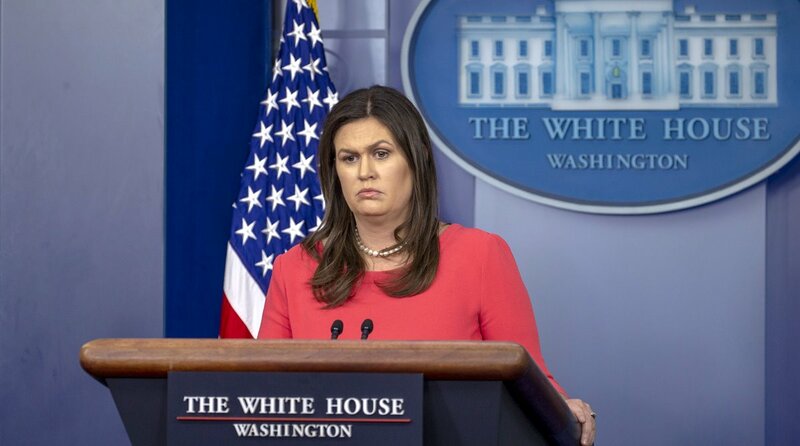 In her first news conference after the Helsinki meeting between Trump and Russian President Vladimir Putin, Sanders accused the media of going hysterical on issues relating to it. It shows frankly the outrageousness and the just desire to find the negative in everything that this President does, she said. “Just because that somebody was simply red-headed, they were accused of being some sort of spy for Russia. I think that this has gotten totally out of control. You guys need to take a little bit of a step back, slow down and quit going after the Trump administration on every single thing that takes place,” Sanders said. Trump, she said, thinks that the US has to focus on securing its election integrity and election systems. This is the reason why he has spent so much time with his administration making sure that this doesn’t happen again. “Let’s not forget that this didn’t happen under President Trump’s watch, this happened under the Obama administration. We’re taking steps, we’re making bold reforms to try to fix this and make sure it never happens again because we take it seriously and because we recognise that our election systems are incredibly important and is certainly a cornerstone of our democracy,” the presidential advisor said. The Trump administration, she said, was trying a new approach on its relationship with Russia. Trump discussed some of these things directly, face-to-face with Putin, she said. “The president also sees this as an opportunity, as he said many times, to be able to work with Russia. He recognises the fact that 90 per cent of the world’s nuclear weapons are under the direction of the US and Russia,” she said. He thinks it’s a good thing to get along with the other person that controls that much of the nuclear arsenal across the globe. He wants to create a more stable world, a more peaceful world. “We can’t do that if we can’t get along with Russia in some capacity,” she said. At the same time, the administration has called him out. “We’ve been tough. We’ve approached this in a totally different fashion than has been previously done, because what’s been done in the past hasn’t worked, so we’re trying a new approach. “But to act like he hasn’t been tough on Russia, that he hasn’t called them out is simply not true, and it simply completely changes everything that this administration has done in regards to that country,” Sanders added. Many US lawmakers have expressed concern that Russian meddling might happen again in November’s midterm elections. On Monday, during a joint press conference with Putin following their summit in Helsinki, Trump contradicted US intelligence assessments regarding Russian meddling in the 2016 election, saying he did not see any reason why Moscow would intervene. “The meetings with NATO, the United Kingdom and Russia were a tremendous success,” he said.